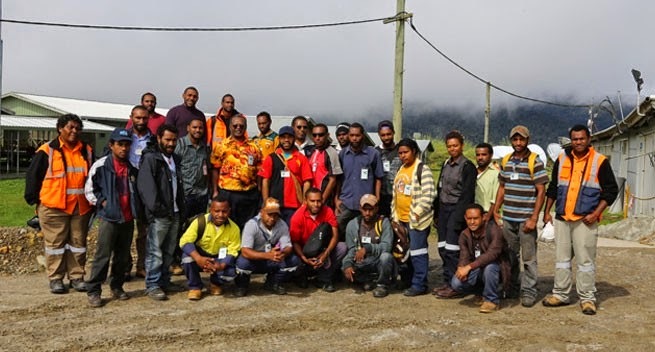 Twenty-three Mining Engineering students from the University of Technology (Unitech) visited Hidden Valley Gold mine in Morobe Province on Friday 29 August. The visit is part of Hidden Valley’s Community Affairs ongoing community engagement program aimed at creating awareness and learning on the mine operations including environment management programs. Two senior department lecturers accompanied the students. The lectures said the excursion provided an opportunity to take learning out of the lecture halls and into the field. “We don’t always have the opportunity to expose our students to see such facilities and learn. And we would like to thank Hidden Valley for making it possible for us to come and see firsthand what we learn in class,” said Lecturer Francis Kusai. Mr Kusai said learning from those in the field gives the students a perspective of what to expect, the strict safety guidelines, the key roles each department plays from mining operations to processing, environment monitoring and tailings storage facility and safety. Hidden Valley Safety Coordinator Joel Amani told the visitors during a brief safety induction that when visiting any mine operations there are always safety rules. “You must know your safety rules first. Those are compulsory. Each section you go into has strict safety guidelines and every employee must adhere to them,” Joel said. Senior Plant Metallurgist, Joseph Kikako explained how gold was processed through various stages as ore material from the pits to the processing plant. Senior Hydrologist Nick Sumali talked about the environment management programs which include a daily monitoring on the Watut River and collecting real time data. “We have monitoring stations situated from Upper Watut and down to Markham River and our first compliant point is down at Nauti village. Our team does regular checks on a daily basis as part of our compliance,’ Nick said when the group visit Pihema Creek. Students also had the chance to visit the laboratory to see how minerals were sampled and classified on different grades.